Enduring the negative is difficult, but hearing the positive is encouraging. From a translation of a French article on American troops, here is an interesting take on things in Afghanistan. And combat ? If you have seen Rambo you have seen it all – always coming to the rescue when one of our teams gets in trouble, and always in the shortest delay. That is one of their tricks : they switch from T-shirt and sandals to combat ready in three minutes. Arriving in contact with the ennemy (sic), the way they fight is simple and disconcerting : they just charge ! They disembark and assault in stride, they bomb first and ask questions later – which cuts any pussyfooting short. Gatorade, proteins and creatine. Things given to boys in their football years and shipped to them in Care Packages to make then strong. Just so, and thanks to the French warriors for this report. Band of brothers indeed. Some of our warriors have given the ultimate sacrifice in the service of America in Operation Iraqi Freedom and Operation Enduring Freedom. 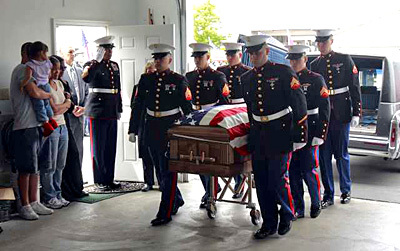 In the picture below (h/t Tony Perry, credit AP), the casket of Marine Sgt. Michael T. Washington arrived Thursday at a funeral home in Auburn, Washington. 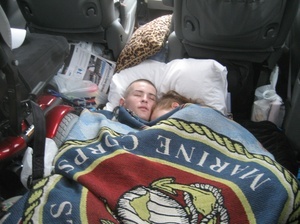 He was based out of Twentynine Palms, and died supporting Operation Enduring Freedom in Afghanistan. Now notice further the Marine standing in the doorway saluting. It is his father, Michael W. Washington. The picture leaves us without words, except to reiterate prior prayers and condolences. It is because of such men we are free. Semper Fidelis. The sentiment where one opposes the war but supports the troops has evolved into mocking the troops regardless of any war. The Onion (famous for satirical or fake news) released a report entitled Love Letters from U.S. Troops Increasingly Gruesome. The Captain’s Journal hates to bring any more attention to this sophomoric tripe (it really is very poorly done and inept), but its real value might very well be the instruction it gives us about the author in contrast with its subject. According to a Pentagon report leaked to the press Monday, love letters written by U.S. troops have nearly tripled in their use of disturbing language, graphic imagery, and horrific themes since the start of the war. That’s enough for the reader to get the basic picture. It’s a sad testimony to a narcissistic generation which has no value system except self worship. But self worship inevitably leads to the mocking and denigration of others. This mockery of the troops could very well have been written about World War II veterans and the horror they witnessed, or any other warrior in any other war. It has nothing to do with the campaign for Iraq or Afghanistan. It doesn’t even have to do with whether there can be good wars. The authors are engaged in heartless, remorseless cruelty in the mocking of the pain and sacrifice of Soldiers, Sailors, Airmen and Marines on their behalf. To be able to benefit from the pain of others, and then to mock their benefactors, is a sadistic skill that only the darkest of souls is able to master. The warriors who fight for America, however, stand in marked contrast to this. The physical pain, the deprivation, the loneliness and time away from family all testify to the commitment and indomitable spirit of the American warrior. On the one hand, you have the American warrior who is committed to give his very life if necessary for our protection and freedom, while still others will live out the balance of their lives with PTSD, traumatic brain injury or lost limbs. On the other hand you have those who would mock this commitment and dedication. The contrast couldn’t be more stark. America has a future only to the extent that the former rather than the later constitutes her soul.